Erected by Chillicothe Rotary Club. Location. 39° 20.185′ N, 82° 58.795′ W. Marker is in Chillicothe, Ohio, in Ross County. Marker is at the intersection of Water Street and Mulberry Street, on the left when traveling east on Water Street. Touch for map. 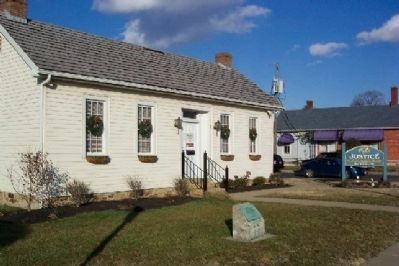 Marker is in this post office area: Chillicothe OH 45601, United States of America. Touch for directions. Other nearby markers. At least 8 other markers are within walking distance of this marker. Ross County World War I Memorial (about 700 feet away, measured in a direct line); Cultural Influences of Chillicothe and Ross County (about 700 feet away); Enderlin Civil War Memorial (approx. 0.2 miles away); The "Statehood Riots" / The Enabling Act 1802 (approx. 0.2 miles away); Banking Crisis of 1819 (approx. 0.2 miles away); Scioto Lodge No. 6 F. & A. M. (approx. 0.2 miles away); Site of Ohio's First Statehouse (approx. ¼ mile away); Court House Renovation (approx. ¼ mile away). Touch for a list and map of all markers in Chillicothe. Mulberry Street in right background. More. 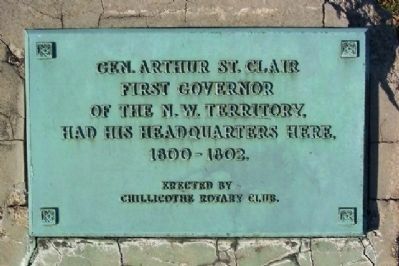 Search the internet for Arthur St. Clair's Headquarters. Credits. This page was last revised on June 16, 2016. This page originally submitted on December 24, 2008, by William Fischer, Jr. of Scranton, Pennsylvania. This page has been viewed 954 times since then and 4 times this year. Photos: 1, 2. submitted on December 24, 2008, by William Fischer, Jr. of Scranton, Pennsylvania. • Bill Pfingsten was the editor who published this page.